I’ve written about Mouse Guard’s qualities before. It’s one of my favorite systems, from its core dice mechanic to its setting and flavor. But some things are better appreciated with a bit of perspective, and so it is with Mouse Guard’s failure rules. After years of trying other games, I came to realize that none of them handle failure as well as Mouse Guard, and it isn’t for lack of trying. What to do when the dice thwart players has been a subject of intense debate ever since the first roleplaying games appeared, but no other system has done as well as this little game about mice. The core dice mechanic for Mouse Guard and its younger sibling Torchbearer look pretty simple on paper. PCs roll a number of d6s determined by what ability they’re using, plus or minus bonuses and penalties, and any die that comes up four or higher is a pass. Each roll needs a certain number of passes to be considered a success. If a PC doesn’t get enough passes, the roll is considered a failure. At this point, one of two things can happen. First, the GM can impose a twist. With a twist, the PC’s goal does not occur. Instead, something else interesting happens. If the PC was trying to gain access to the villain’s office by picking the lock, they aren’t able to get the lock open because they hear guards approaching. Now the PC has to deal with the guards, and the game continues. Alternatively, the GM can impose a condition. Conditions are mental or physical states that penalize the character in some way. Mouse Guard and Torchbearer have six: Hungry, Angry, Afraid, Exhausted, Injured, and Sick. * Being Injured makes most rolls harder; being Afraid reduces the PC’s ability to help their friends, etc. Each condition also has its own requirements for recovery. Sometimes a character can recover by rolling their own attributes; sometimes they need an ally to use a healing skill. When the GM imposes a condition, the PC still achieves their goal. In the lockpicking example, the GM might describe how the character backs into a dark corner as the guards walk past, joking about the prisoner they executed that morning. The PC is able to finish picking the lock afterward, but they have gained the Afraid condition. This approach is often known as a “fail forward” system, because while there is a penalty for failure, it doesn’t stop a character from getting what they want. Now that you’ve got a good idea of how the system works, let’s talk about why it’s the best failure system out there. The worst-case scenario of a failed roll is the GM saying, “It doesn’t work.” Everyone is silent for a moment, and then the player either asks to try again or awkwardly tries to formulate a new plan. It slows the game down and makes players dread the dice not going their way. Rolling again is repetitive, and trying a different approach isn’t much better. The problem is the same, and the player already tried their best idea for resolving it, so trying to come up with an alternative strategy feels doomed from the start. The twist heads this problem off at the pass. A failed roll never results in head-scratching over what to do next, because if the GM denies the PC’s goal, it’s only to take the story in a different direction. The PC in our previous example isn’t trying to pick the lock anymore; now they’re trying to evade the guards. The situation has changed, and so it feels natural that the character should employ a different strategy. To a lot of RPG veterans, this dynamic seems obvious. The internet is full of articles and videos about how a failure shouldn’t mean the players just have to roll again. And yet, many systems are still being published with the old assumption that failure means the PC’s goal wasn’t accomplished and that’s it. Of course, a good GM can always create twists on their own, but if someone is new to the medium and then picks up a game that follows the old methodology for failures, they won’t know there’s a better way. A lot of games that stick with the “retry” approach to failures are part of a legacy series, which is to be expected. Systems like Call of Cthulhu and D&D have been doing their own thing for decades. If they tried to switch paradigms now, they might explode. But a lot of retry systems are brand new. Edge of the Empire came out five years after Mouse Guard, and it still assumes a failure means the PC simply didn’t get what they wanted. Even otherwise forward-thinking games make this mistake. Despite their advanced design and storytelling-focused approach, both Blades in the Dark and Scum and Villainy often leave players in a position where they simply have to roll again after a failed roll. So while the twist may seem obvious to some of us, it’s not something we can take for granted. Of course, the twist is only the tip of Mouse Guard’s iceberg when it comes to handling failure, so let’s see what’s lurking beneath the surface. The problem with the twist and similar mechanics is that on their own, they create a real burden for the GM. It’s hard to come up with interesting consequences for every failure, especially in systems where the players make a lot of rolls. This burden is so high that I often find myself going out of my way to make sure players never fail rolls, because I just don’t have the energy to think of a cool twist every time. That’s obviously not ideal, but how does Mouse Guard solve the problem? With conditions, of course! If a player fails their roll and the GM doesn’t have anything interesting in mind for failure, they can hand out a condition and move on. The player still feels a consequence for the failure, and the game doesn’t have to stop while the GM struggles to think of something interesting. This dynamic was made startlingly clear to me a few months ago after I wrapped up a year-long Torchbearer campaign. * I’d gotten so used to assigning a condition and moving on that when I played systems without that option, it was exhausting. I was indignant. Did the game really expect me to come up with an interesting twist after every failure? Didn’t it know I had better things to do? That’s not a joke; I did have better things to do, as do all GMs: crafting the story. Mouse Guard’s conditions handle a particularly onerous task so the GM can devote their energy where it belongs. If there’s a cool twist to be had, then great, the GM can implement it. If not, then they can get on with telling their story unburdened. Beyond making life easier for the GM, Mouse Guard’s conditions have another benefit: they act as a roleplaying guide for players. When a character gets the Afraid condition, the player knows what that means. They can use that prompt to inform their roleplaying in whatever way makes the most sense for the character. Players feel increased tension as their characters gain more conditions. They know that if their characters are Injured, Sick, and Hungry, things aren’t going well. Gaining conditions simulates the natural buildup that happens in any good story and is a strong support for the GM’s own efforts. While the mechanical penalties imposed by conditions are important, it’s the condition’s specific flavor that’s most helpful in this case. Players know what it means for their characters to be Injured, even if they sometimes forget the -1 die penalty on skill rolls. That’s why Mouse Guard’s system works better than the more generic conditions found in other systems. Knowing exactly what’s wrong with your character is more impactful than a simple penalty. There’s also plenty of story material to be mined in getting rid of conditions. For one thing, PCs must have a safe place to recover, which necessitates a break in the action. Mouse Guard and Torchbearer both have special game phases for this. These low-tension moments give players a chance to catch their breath, the same way a prose story will add dips in the action to avoid exhausting readers. If the characters have more conditions than they can recover from on their own, that creates additional story opportunities. Finding a skilled healer of mind and body can be a small adventure in its own right. While there are no absolute truths in roleplaying, the closest thing I’ve found is that players don’t like failing rolls. This fact persists no matter how many RPG books include a section about how the players shouldn’t mind failing rolls. It is so prevalent that if I knew a way to make roleplaying work without having failures of any kind, I would do it. Unfortunately, no one knows how to do away with failures entirely, so the best we can do is make them a less bitter pill to swallow. Some of this just comes down to GMs: players will respond much better if their failure is caused by an outside element rather than their character’s incompetence. That’s why our lockpicking example has the character failing because guards have arrived, rather than jamming the lock shut through ineptitude. 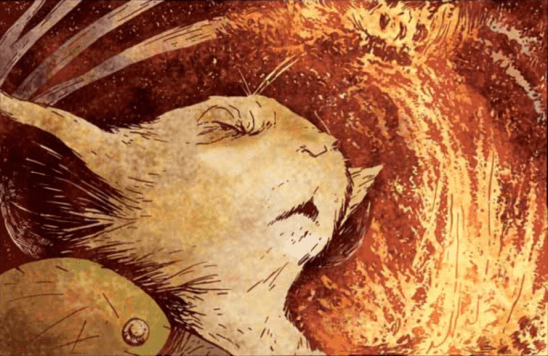 Mechanics also have an important part to play in soothing failure’s sting, and that’s where Mouse Guard’s rules come in. When players fail a roll in this system, they know they’ll either get what they wanted at the cost of a condition or not get what they wanted and not be penalized. That means there’s only ever one negative consequence. The mechanics create a social contract where players have at least some assurance that failures are being used to keep the game interesting rather than punish them for rolling badly. This social contract is notably lacking in other games. By default, it’s almost expected that if a PC fails their roll, they’ll lose their goal and receive some kind of penalty – physical damage or otherwise. At first glance, this double loss seems to make sense. If you’re climbing a tree and you fall, you would both take damage from the fall and fail to reach the top, right? But in the abstract world of roleplaying games, players are more concerned with how well their character does than playing with precise realism. Having only one consequence for failure keeps people from getting discouraged when the dice don’t go their way. Occasionally, situations will arise where a single consequence just doesn’t fit with the narrative. If a PC draws steel to stop the ultimate badass villain from escaping, it’s reasonable to expect both physical damage and an unachieved goal. Mouse Guard uses its extended conflict system to handle these situations. The extended conflict rules are more complex than a standard roll and allow for a more nuanced approach when necessary. One of RPGs great design conundrums is how to create character abilities that are mechanically relevant without overburdening the system. If a new ability relies entirely on flavor, then it isn’t very useful. If it mimics what other abilities already do, like Fate’s endless ways to get +2 on a roll, then the ability is boring. But adding the rules needed to support mechanically relevant abilities can seriously increase a system’s complexity, making it harder to learn. Enter Mouse Guard’s conditions. The conditions themselves are simple, and it’s easy to understand how characters acquire them. Conditions are also a core part of the game since they appear when someone fails a roll. These two factors make conditions a perfect stepping stone to other abilities. For example, let’s say you’re running a Mouse Guard campaign and you design a special ability called Meditative Mind. This ability would grant an extra die on rolls to recover from the Angry and Afraid conditions. Or you might craft a Glutton for Punishment ability that cancels the first Injured condition a character receives each session. Both of those abilities are mechanically distinct. They serve clearly different purposes, and no one will ever get them confused. They’re also certain to be useful because these conditions come up all the time. They’re great ways to customize a character, which is always popular. For all that benefit, these abilities and others like them add very little burden to the game. They’re working off the existing failure system, which requires little effort to learn. Ironically, Mouse Guard doesn’t make much use of this option, but Torchbearer does. Many of Torchbearer’s class-dependent abilities alter conditions in some way, and it works great. A fighter who takes the Cool Headed ability feels mechanically distinct from a fighter who takes the Endurance ability. One doesn’t get Angry, whereas the other is better at recovering from Exhausted. This is the kind of depth many players crave, and it barely increases the game’s complexity. It’s been over a decade since Mouse Guard first hit shelves, and a lot of great games have come out since then. But as great as these other games are, none that I’ve played can hold a candle to the way Mouse Guard handles failure. That could change of course; roleplaying is a medium of constant innovation after all. But until then, Mouse Guard’s system is proven to work, and designers could do a lot worse than simply emulating it. There are technically two more, Fresh and Dead, but they’re unusual and not important for the purposes of failure. Torchbearer uses the same failure rules as Mouse Guard, if you recall. Anyone who wants to see how failure can be both interesting and hugely entertaining just needs to watch the Indiana Jones movies. This guy keeps failing at almost everything he tries. Sometimes he eventually seems to succeed, but it comes with a twist that means he still has no time to rest. You may be interested to know this post was submitted to r/rpgdesign for discussion. I think this headline makes a few sweeping generalizations that overlook some things if you want a different style of game. One aimed at simulating a fictional world, for example, instead of following the dramatic structure of a story. The problem that this kind of mechanic is supposed to address won’t arise if, when running the game, you remember not to call for a check when the action has no consequences that matter to the game in the first place. If a character knows how to do it, isn’t pressed for time and in no danger, assume they succeed and move on. Sometimes when the GM just improvises the most interesting dramatic twist they can think of, it can be frustrating and unfair to players because the consequence of their failed action had no logical connection to the outcome they received. When there is no link between cause (a player’s choice of action) and effect (the consequence that happens if they fail), then choice can lose its meaning, making it pointless to try and plan effectively or weigh the merits of different actions in order to avoid risks. Nice to see the post getting around, thanks for letting me know! It’s true that GMs are best served not calling for rolls when the PC has plenty of time, isn’t threatened, etc, but here’s the thing: In most games, plenty of situations will come up where the PC is under some kind of threat when they ask to do something, but the GM has difficulty thinking of a cool twist for failure. For example, if the GM is describing the PCs coming face to face with some unfriendly soldiers, and one of the PCs is like “I’m gonna steal the orders those soldiers are carrying.” That certainly feels like something they should have to roll, and the GM could probably come up with some interesting twists if they had to, but if the GM is currently thinking about something else, they can avoid distraction by handing out a condition instead of trying to think of a twist that is both meaningful *and* doesn’t derail the story. Awesome, thanks Dave! the “succeed at cost” (usually called “fail forward”) concept isn’t unique to Mouse Guard by any means, but I do think Mouse Guard is the best execution of it. I am a bit surprised because several systems use similar ideas that I’ve considered it fairly common. Fate immediately comes to mind, weirdly enough, you mentioned Blades in the Dark, but accepting conditions and twists is pretty much what happens when you fail in that one as well. Heroquest (the universal rpg version) point blank encourages and provides examples of conditions and twists to work. I kinda figured “fail forward” was the new indie rpg thing. Fail Forward is certainly gaining popularity, both in design and in how GMs run their game, but it’s far from universal and some systems do it better than others. Both Blades in the Dark and Scum and Villainy, for example, can easily leave PCs in a situation where the main result of failure is to simply try again. I feel like this post is missing the forest for the trees a bit. All of the stuff you are praising it for is present in Blades in the Dark — I have just reviewed all the possible consequences of rolls in that system, and the closest one to “You can just roll again” is “Press on by exploiting a risky opportunity” which still implies that the situation has changed. There are no “you can try again” results in Blades. What’s more, you miss what is actually unique Mouse Guard and how it reduces the GM cognitive load: It restricts the number of rolls. A Mouse Guard “mission” has, as designed, two obstacles that may lead into twists. That’s it. Yes, those twists may have their own twists, if you want, but at the end of the day, you don’t roll very often in Mouse Guard, unless you’re in a conflict, where all the rules change about what “failure” means. It’s literally possible to write down all the possible twists you want in your Mouse Guard game (or at least, the GM’s Turn) in advance, because there are probably only 2-4 of them, since actions are so broad. (This is tied into the advancement system as well – allowing too many rolls per session in Mouse Guard will cause the PCs to advance very quickly.). So no, Mouse Guard doesn’t “handle failure” better than other games, though it might do a better job of codifying how it does so, and it does reduce the number of times the GM will have to come up with a twist on the fly. I’m glad you like Mouse Guard. I like it too. It does a great job of explaining some stuff like this. But it’s not really all that unique in how it actually does it. The example in the next paragraph does show an example where the GM grants the PC’s goal along with a serious consequence on a 1-3, so it’s not a certainty, but the rules allow and even encourage a failure to result in nothing happening and a nasty consequence. This is even more likely if you’re playing off the GM cheat sheets instead of looking up the result in the book every time. In both Blades and Scum, the 6 and 4-5 results say “you do it” while the 1-3 results do not. Any scenario in which the PC fails their roll but the situation doesn’t significantly change (which could happen under “you lose this opportunity” but not the others), they simply have to try again. Both books also have examples of a 4-5 partial success that simply necessitates another roll. Again from Blades, page 30, under the “reduced effect” heading, “You’re able to scale the wall, but it’s slow going—you’re only halfway up.” If the PC’s goal was to scale the wall, and they’re only half way up, the obvious thing to do is to roll again to get the rest of the way. I’m not sure where in Mouse Guard it says there are only two rolls per mission by default, but if it is in there, that’s not related to its failure mechanics. It’s also a really weird requirement and I have never seen anyone play Mouse Guard that way. It feels more like you have an issue with the examples than you do with the game. At worst, Blades has every option that Mouse Guard has and then some — you’re never required to use “reduced effect” unless it makes sense to do so, such as, for example, injuring someone in a fight instead of killing them. And it never has to be used on its own. There are a lot of “ands” in that text that indicate that yeah, you might want to inflict reduced effect (“You’re halfway up the wall…”) and a complication (“…when the patrol down below starts shooting at you.”). It’s true that the game doesn’t guarantee success on a condition, though again, the rules clearly state that you can grant it if you want. As for the two rolls thing — it flows from the “Pick two types of obstacles” in mission design and dovetails with the fact that the players aren’t allowed to call for rolls during the GM’s turn. Playing Mouse Guard with a traditional RPG style pile-o’-rolls for everything rapidly launches you into a mess where the PCs collect a ton of advancement and you’re forced to either invent tons of complications or apply tons of conditions. The pacing is the key to keeping things from going off the rails here. Sure, that’s verbatim the same reply you posted to comrades. But the rules I just quoted directly from the book are refuting what you’re saying. They tell you never to allow the situation to stay the same to reroll the same action. This is basically a more nuanced version of the “Twist” you referenced in mouse guard. You fail to achieve your goal, and the situation changes in some way that you now have to deal with. The concept of failing forward is also one that’s completely inherent to the mechanics of the games built on the Apocalypse World engine, on which Blades in the Dark is based. Just for the record so we all have our fact’s straight, Burnging Wheel specifically does not have failure condition mechanics. The failure rules (page 31 of Burning Wheel Gold) are fairly straight forward. When the test is failed, the GM is supposed to make something interesting happen that continue’s the story. That’s half of the Twist/Condition dynamic that Mouse Guard uses, the Twist half to be precise. Some sections of the rules like spellcasting have more detailed rules for failure, but for the majority of rolls there’s no equivalent to conditions. It still includes the genesis of the failure mechanics used in Mouse Guard. Mouse Guard refines, improves and expands the mechanics for sure, but the original seed of these mechanics was in Burning Wheel and I feel like that’s something that really should have been discussed in teh article to give proper context to how these mechanics are developed. That’s, I think, one of my major criticisms of your articles on RPGs: that you don’t seem to ever go into any of the development or circumstances of their creation beyond what is written in the rulebooks themselves. If you’re going to be discussing RPGs from a theoretical perspective I feel that the history of role playing games as a medium and the various schools of design thought that go into their development is important information to go into and think your articles would benefit from you doing some in-depth research into some of the other schools of thought in regards to design that have appeared in the last decade as they very often touch on many of the same principles you discuss. In short: My problem is not that you didn’t choose Burning Wheel over Mouse Guard, it’s that you’re discussing the mechanics of Mouse Guard but are making no mention of Burning Wheel, which is like discussing the neoclassical era without any reference to the Ancient Romans or Greeks. I found that many people have less inhibition to play a PnP-RPG when failures aren’t punished that harsh or mess up the story. Many people seem to think of PnP-RPGs as something one has to know the Rules perfectly and bend them to have change… very odd. At least that was it with my players and they had few experience before we started playing weekly. There’s an RPG I’m looking into getting into that has something similar in approach to failures but I had no idea Mouse Guard used a similar mechanic. There were times when I used it unknowingly and now that I think about it, it certainly makes sense to have it implemented more often. Wow, just when I was thinking about something like this to improve my homebrewd system, here you come in my aid! I am always very displeased when playing and the game is just not moving forward because I failed a roll or because nobody could even make such roll for not having the necessary skill. And, when we roll badly, well, the GM either comes up with an excuse to reroll (hmmm, one hour passed, and now that you have more ‘clarity’, you can try to read that scriptures again); or he says we failed, moves on and leaves that part of the adventure off the gameplay. And maybe we’ll be lucky if the special item needed to defeat the boss wasn’t there… I feel like I’m in a Zelda game, where without certain items/ abilities, I just can’t move forward, make it sense it not! I was thinking about something like conditions in my game, and boldly, as a way to even substitute and supplant the ‘HP mountain’ problem. Also, not only “negative” conditions that impose penalty rolls, but “positive” conditions that boost them. After all, if you can get Afraid, Injured or Paralysed, you could also be Euphoric, Focused or Courageous! Also, in very interested in the class-dependant abilities that add flavor to the pot instead of just another bonus or extra attack, which, as you said, are very bland and don’t actually CHANGE the character, in my opinion. Saying the warrior became Cool Headed can (and I dare say, must) extrapolate to all the roleplay, while a +2 on wisdom rolls to evade the aftermath of being Bewitched is not so broad, and might not be useful most of the time. Hey Tenorius, glad you enjoyed the post! It can be a real bummer when you fail a roll and then just… nothing happens. I guess you can’t ever find out what was on the other side of that door, time to move on. Your instincts are good there. Positive condition is an interesting direction to take things. Torchbearer has the Fresh condition, which gives a bonus to all rolls, but that’s it, so you could break some new ground there. Yeah, not getting on with the story is completely frustrating! At least DCC doesn’t actually demands that you have magic items (or a certain magic item) in order to finish the official adventures. But again, the system isn’t preoccupied in keeping you alive either, allowing you to control lots of characters at the same time. But still not ideal for me. Our GM used to tell us the”things” we left behind for not being able to unlock that safe, or decipher the runes in the chamber… Not cool! About the positive conditions, does Mouse Guard have them too, like the Fresh condition? I’m considering studying it (but not Torchbearer, as I’ve read in many of your articles that it’s obliterating in rules, and I already have too much on my plate)? Mouse Guard technically has the “Healthy” condition but it doesn’t actually do anything, it’s just the condition you’re in when you have no other conditions. And like I said, TB’s “Fresh” is really basic so you probably don’t need to worry about studying it to come up with your own stuff.